The Kid's Meal beverage is available at no extra cost. ATLANTA (Jan. 14, 2016) – Beginning January 18, Chick-fil-A® customers can order the chain’s first organic menu option, Honest Kids’ Appley Ever After® juice drink, as part of the Chick-fil-A Kid’s Meal in restaurants nationwide. Appley Ever After is available in 6 oz. juice boxes and is sweetened only with organic fruit juice, giving it half the sugar of the leading kids’ juice drink1. One box contains 100 percent of the recommended daily value of Vitamin C, has no added color, is USDA Certified Organic, gluten-free, kosher and has no GMOs2. It will be available as a beverage option with the Kid’s Meal at no extra charge, in addition to low-fat regular or chocolate milk and fresh-squeezed lemonade. In 2012, Chick-fil-A was the first quick service restaurant to add Grilled Nuggets to its Kid’s Meal, setting a higher standard for children’s meals in the industry. Chick-fil-A continues to adapt to the growing needs and health preferences of its customers. In addition to adding the organic Appley Ever After, the company also recently launched a new Superfood Side, an all-natural Greek Yogurt Parfait, removed trans fats from its entire menu in 2008 and more recently removed high fructose corn syrup and artificial colors from its dressings and sauces in 2015. 1 Honest Kids contains 8g of sugar per 6 oz. juice box. The leading kids’ juice drinks contain approximately 16g of sugar per 6 oz. serving. 2 No GMOs means that if there is a bioengineered version of an ingredient, we don't use it. 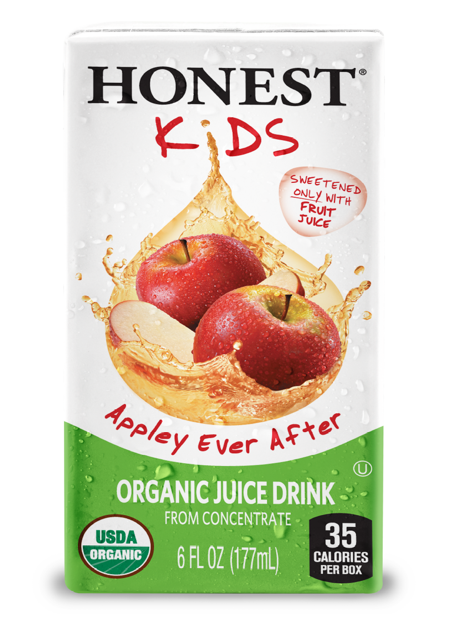 “Honest Kids” and “Appley Ever After” are registered trademarks of Honest Tea, Inc.